See the 3 on 3 tab for more information. For over 40 years Arrowood Basketball Camp has been providing athletes with a quality camp experience by helping young girls become better basketball players and better individuals. The thing that makes Arrowood truly unique is that we also understand that team chemistry can often times be more of a factor in a team’s success than individual or collective ability, which is why we take the time to develop athletes’ skills & leadership abilities off the court, in addition to on the court. Check out our brochure below and our website at camparrowood.com for more information! THANKS to all the players, coaches and fans for joining us on Sunday, November 11 at Whitney for a day of basketball. The annual Toys for Tots Jamboree was a success! Through everyone's efforts, many less fortunate children will have a better Christmas Holiday. We collected over 265 toys this year!! Thanks again for supporting the Toys for Tots program! The goals of the SCAYBA Basketball Program are to develop the basketball skills of the youth in the St. Cloud Area; to encourage sportsmanship at all times; build character and confidence, and above all, to enable the youth to enjoy the game of basketball. To achieve these goals, the SCAYBA Basketball program encourages all participants, be it players or coaches, to act in a responsible and respectful manner on and off the court. Parent volunteers are always welcome! SCAYBA could not exist if not for the parent volunteers that we get every year. We not only look for parents to help coach and participate in various programs, but we can use help in other ways. We always welcome assistance with our annual tournament. Also, event reporting and updating the team website page with updated tournament results and pictures or photography and videography for the website or facebook page. Whatever talents and/or ideas you may have to help get the word out about SCAYBA programs are certainly welcome! Just contact Tina with your ideas or for more information about how to become a volunteer! The St. 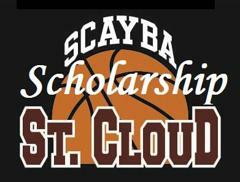 Cloud Area Youth Basketball Association is proud to offer the SCAYBA Scholarship. The SCAYBA Scholarship recognizes the connection that exists between youth basketball participation, academic excellence, leadership and community service. The scholarship is awared annually to one graduating senior boy and one graduating senior girl from each of the three St. Cloud High Schools. ©2019 St. Cloud Area Basketball Association / SportsEngine. All Rights Reserved.